when i originally set out to write this post my intention was to talk about how hot as g-dang hell i think elvis was in his 1968 come back special but i'll leave that for another time. because, upon searching for some more information on rolling stone's most recent top 100 artists issue i stumbled upon a sneak peak of the artwork that will be featured this year. how do i describe it? i can't. all i can say is that before i saw this little teaser i didn't really care much about getting my hands on a copy but NOW, now i'll be the first one in line at the news stand! 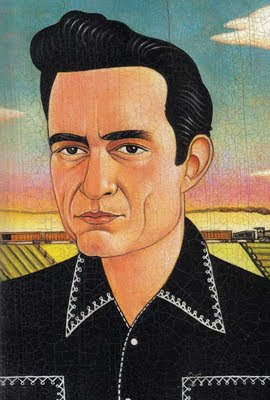 how captivating is this portrait of johnny cash? equally as enticing, each entry is written by another musician. not saying that's good or bad but i am interested to hear what, say, "the other elvis" costello has to say about the beatles.